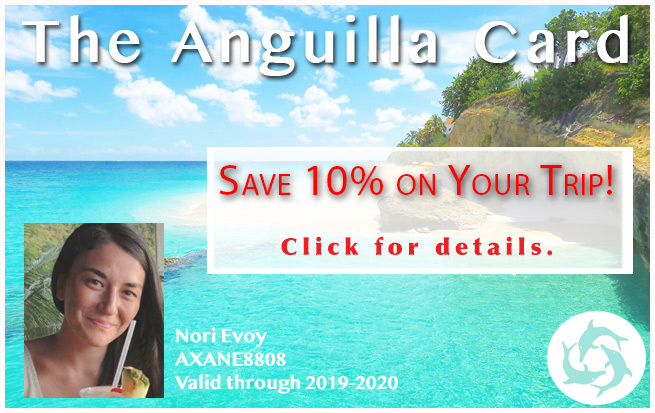 Anguilla's Festival del Mar... A Weekend of All Things "Sea"
A Weekend of All Things "Sea"
What is bordered by cerulean blue water, smells of fresh Johnny cakes and grilling lobsters, sounds of dominoes, music, and laughter, and is covered with smiles and good cheer? 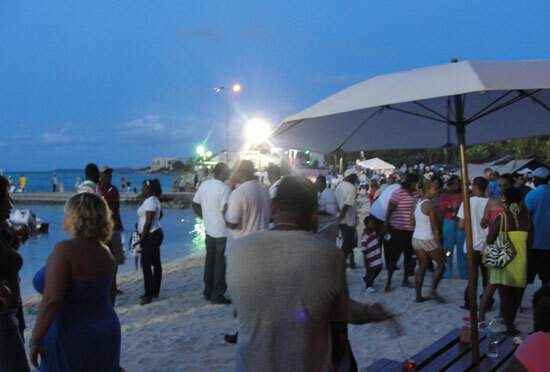 Island Harbour is the location for one of the most festive and local annual gatherings that Anguilla holds over Easter weekend. Sunfish rest on the beach after a tight competition! Haven't heard of Festival del Mar? It all started in 2008 and has grown each year. 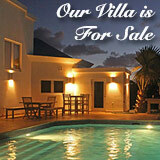 For those who really want to experience Anguillian culture and mingle amongst the locals - this is the place to do it. Fortunately it falls during a time when many are taking Easter and Spring Breaks too! 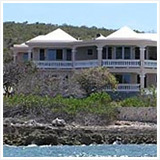 Festival del Mar is held at Island Harbour in the Eastern end of Anguilla. 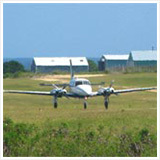 You can find Island Harbour very easily. Parking for this event is also simple. 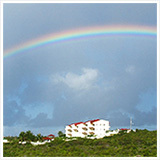 Tip: I recommend parking at the St. Andrew's Anglican Church's parking lot and walking east along the road until you reach the beach. They asked for $2 US, which goes directly to the church. 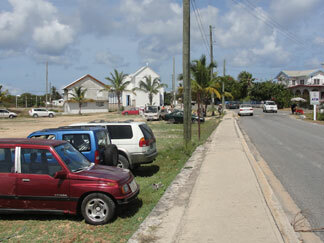 If you get to Island Harbour early, there is plenty of parking along side the road as well. 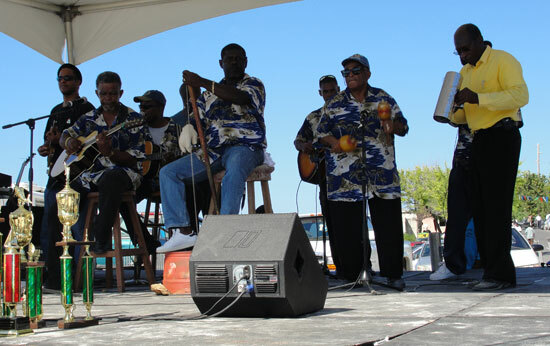 Festival del Mar is a celebration of the sea! 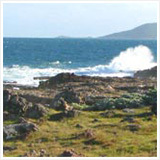 Anguillians are all about the sea and have been for hundreds of years. Their national sport is boatracing. 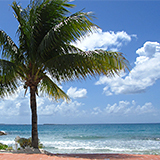 The Amerindians lived off of of everything from the sea and settlements were lined along the beaches. It's only natural that Festival del Mar exists in the first place! But what goes on during Festival del Mar? Held all day on a Saturday and Sunday, you can show up in the morning for breakfast and be entertained until night-time if you please. Tents start serving up breakfast around 10am with a variety of options depending on what tent you visit and what is ready. and shark, saltfish, johnnycake, breadfruit, and salad lunch. 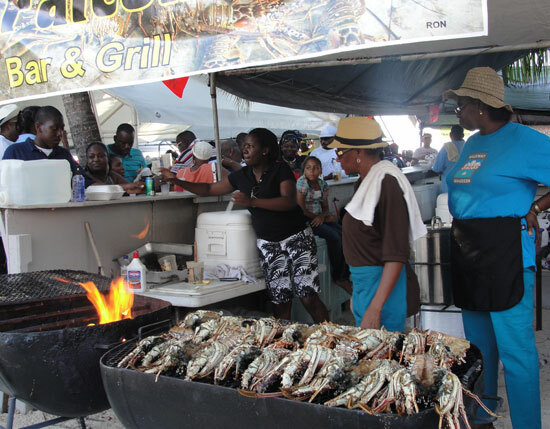 You can find everything from johnnycakes, fried fish, sailfish, shark, breadfruit, salads, and more. If you want to get local, try some bush tea. That looks like a champ to me! If you are not up for bush tea, there are plenty of ice cold beverages to choose from. Cocktails and beer are served all day. I suggest trying some local drinks while you have the chance...the homemade lemonade is usually very tasty and refreshing! Likewise for lunch, many options are from the sea: lobster, crayfish, octopus (sea cat), fried fish, grilled fish, fish balls, and of course johnnycakes and fruit and salad. I was lucky enough one year to get to eat a wahoo steak for breakfast which was from the winning fish of the deep sea fishing contest. Now that's what I call fresh! 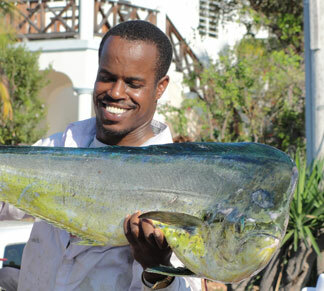 If you don't like seafood, you can find something...but keep in mind this Anguilla event really is all about the sea. Enough about the food... it is amazing though! 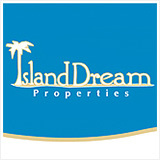 There is much more to Festival del Mar and there is something for everyone. Tip: It can be hot, so wear your swimsuit in case you want to take a dip in the sea and make sure you keep the sunblock fresh. If you want to sit back, relax, and take it all in, there are plenty of tented seating areas for doing just that. You can hear the smack of a dominoes game starting from early as many locals will sit and play all day. 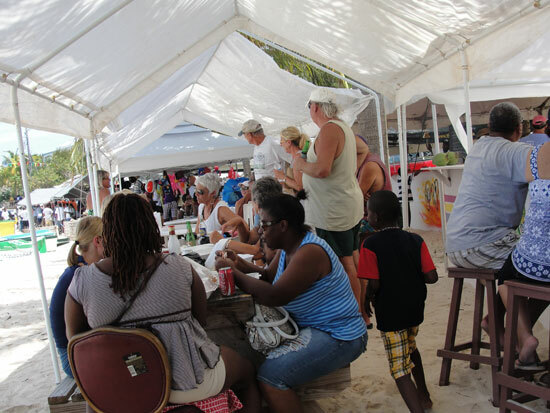 Festival del Mar is the place to be and tents offer plenty of shade from the sun. 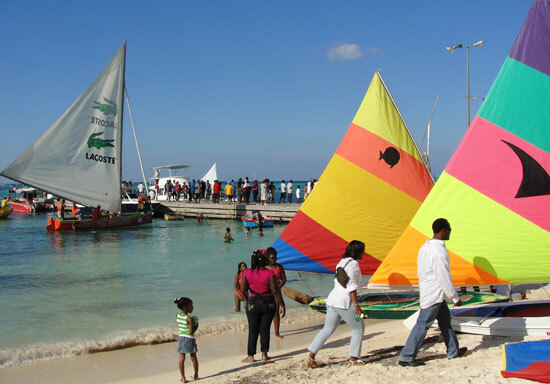 You can stroll along the Island Harbour beach smelling the different smells and looking at vending tables which sell everything from local paintings and handmade crafts to t-shirts, and souvenir bottle openers that say "Anguilla". Be sure to visit the Festival del Mar website to learn the schedule for each day. you can even see a few of the trophies that are ready to be given to the contest winners! 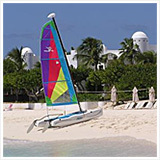 Scheduled events include a children's model boat race, a swimming contest (for both children and adults), a deep sea fishing contest, a solider crab race, sunfish racing, a swimming contest, a B-Class and an A-Class boat race. 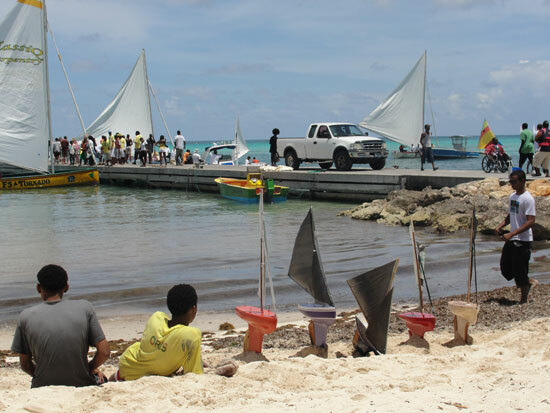 By mid-day the flurry of activity is mesmerizing... children jumping off the Island Harbour wharf over and over again. People of all ages coming and going from the sea to cool off. Boatmen and fishermen coming and going from the wharf and the boatramp with fresh catches and boats that have done their duty for the day. Colorful sails breezing by in the harbor. Music all all types plays throughout the day... some dj music, some live music, and always a local string band with steel pans. The evening ends with live musical performances that run until close to midnight. Now that is what I call a full day! As the sun goes down, the night-time crowd prepares for an evening of live music. 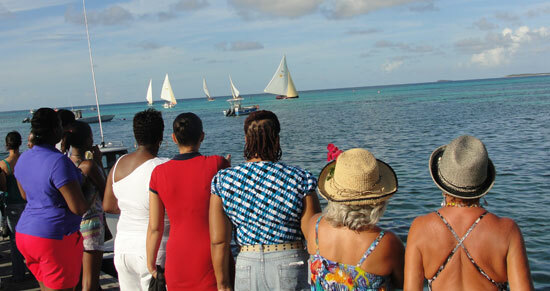 Festival del Mar truly is the essence of Anguilla's culture where the sea is concerned. 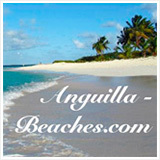 If you haven't yet seen the sea around Anguilla, better put it on your list! It is special and Festival del Mar does a wonderful job of celebrating exactly how special it is. Directions: If you are coming from the West, drive as if you are going to Shoal Bay. When you get to the Shoal Bay round about, hang a left. Drive down that road. It winds for a bit and goes over a bluff. You will see a right turn (just before the signs for Madeariman, Villa Black Pearl and Manoah). Take that right. 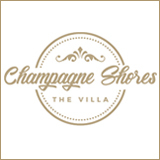 You will drive past Milly's Inn and Allamanda and Ben's Pit Stop. Go down that main street until you reach the stop sign. Turn left. Keep going on that road until you see the Anglican Church on your right. Island Harbour is just a short walk down from that church.